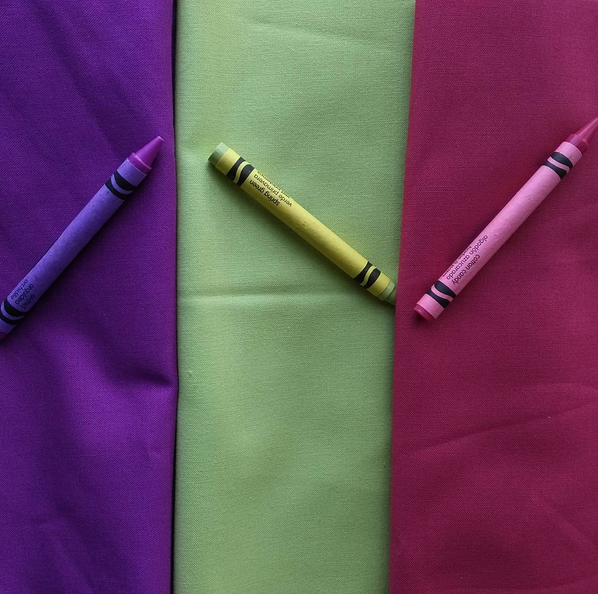 This summer, my guild began a crayon challenge. At one meeting, we had to choose 3 random colors from a bag and make a quilt. Seems daunting, right? Perhaps. 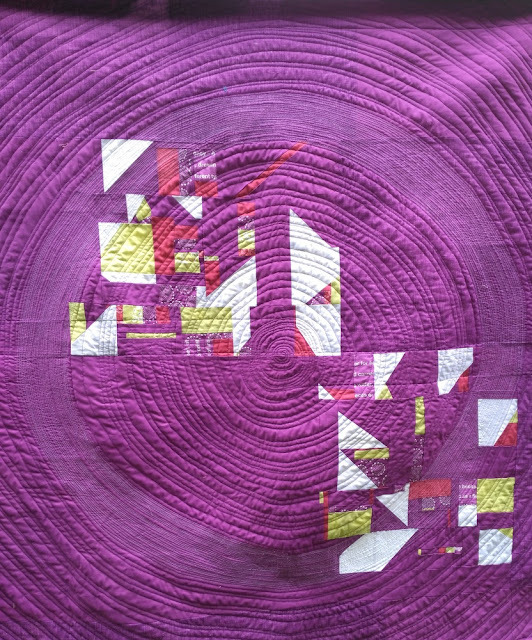 I originally intended to create a challenge piece with the minimum size limitation (12"x12") but when I pulled purple (let alone my favorite purple), it started to become something much larger. Sometimes when the inspiration hits, it's just nonstop (name that musical!). These were the solids I bought that matched my crayons, though this picture is actually a bit discolored; the purple is much brighter and the pink redder. This was a summer where I finished a lot of quilts. But it wasn't simply *finishing* work; it was completing, in some cases, months or years of preparation, experiments, and unsewing. The quilt was made over a short period (about 2 months) but it's probably my most well-made piece yet. 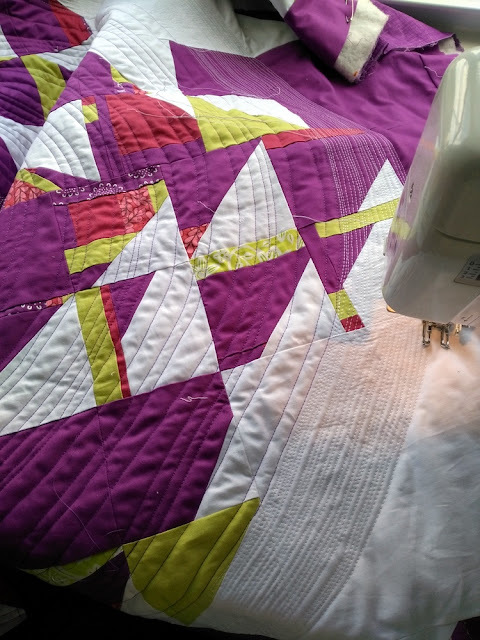 That just goes to show that improvement in all aspects of the quilting progress (namely piecing and quilting) really do get more precise the more and more you make quilts. Don't believe me? Keep making quilts! Though the focus was improvisation, I did make sure that "sewing cloth" was visible (top left). It was just too appropriate! I used the last I had of that awesome word fabric. I wrote about the process of starting this quilt right here, from idea to experimenting in Paint to execution. Generally, I envisioned a wonky version of the traditional Winged Square block, which I've previously used on other projects. It's one of those traditional blocks that sits in my mind and continuously inspires me; it has such a unique lopsided-ness with its placement of half-square triangles (HSTs). 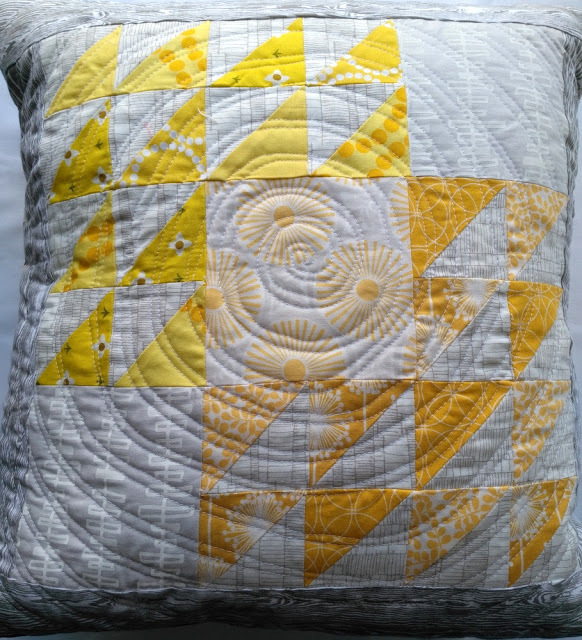 My Sunshine Pillow from earlier this summer, featuring the traditional Winged Square block. 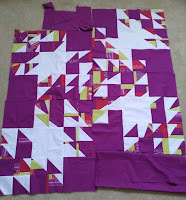 I wanted to try making completely improvised, wonky HSTs, so I gathered up my fabrics and sewed a huge panel using my brick-by-brick improvisation method (Picture 1). Then, I cut it down randomly into squares and pared each square, on a random angle, with a square of white (Pictures 2&3). Some of my improvised HSTs didn't reach trim size, so I simply added strips or scraps of fabric. 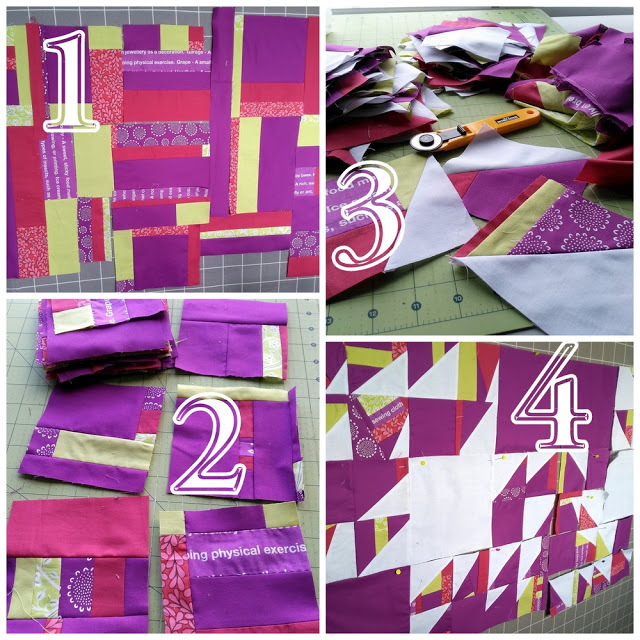 That's what I LOVE about improvisational quilts - you can add things here and there, and it will simply contribute to the overall look (Picture 4). It just doesn't matter! 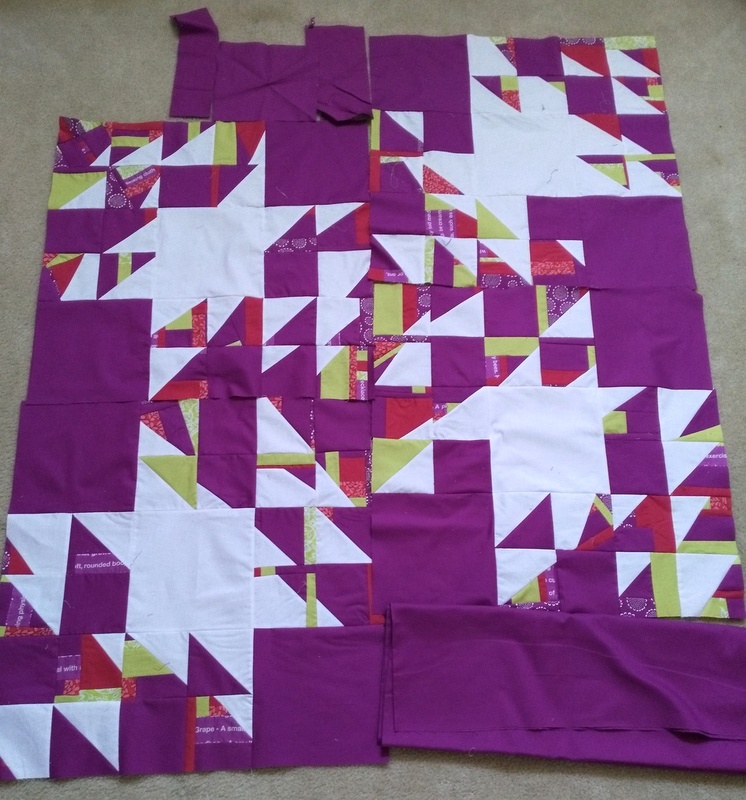 After that, I went through some serious indecision about how to sew the 4 blocks together, though I was set on the traditional layout above as the basis. I used Paint to view both options, and I also took pictures from the 2nd landing in my house. Ultimately, the wonkiness of the HSTs wasn't enough wonkiness (for me), so I offset the blocks just a bit (the right option). This is truly a modern traditional quilt! The backing is a fun conglomeration of all of my little scraps - and boy, it was fun to piece. There were only two options I could envision for quilting. One was quilting every single little piece very densely with straight lines (which would have been boring to do and extremely time-consuming). The other option, a spiral, was also very time-consuming but infinitely more satisfying to me. I always choose fun. If not, why am I quilting in the first place? After some discussions with my quilting guru Jess @jtlevitt, I decided to try quilting a ring of white (50 weight Aurifil 2024) in a sea of medium purple thread (Aurifil 2540, which I purchased especially for this project but find myself using constantly now). 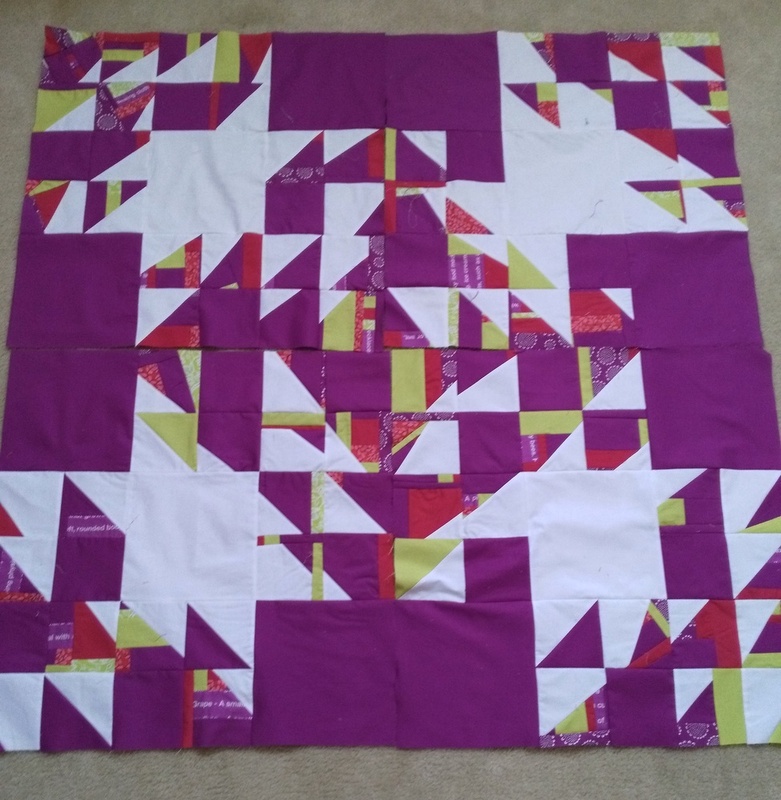 It was all very guess and check - stopping at a point where the centers of the large white squares in each block would be filled with white thread, but accented with the purple. It honestly came out better than I could have imagined, and the pictures don't really do it justice! Also, can you tell that this purple color is really hard to capture accurately on a camera? Don't worry, I still love the purple. I started out quilting with my free motion foot in the middle and switched to my walking foot until I reached the white spiral starting point. That part was all free motion foot too, because I was look for a more "organic" look than perfectly curved. Those lines are realllly close together but it felt like I was creating magic! It's "matchstick quilting" with a twist, really. The picture below came out blurry but I love how it shows the spiral (and especially the white one) so well. That's why I ended up naming this quilt "Crown of Orchids" - for the halo/crown and for the brilliant orchid background (Kona Geranium). Plus, I'd really love a crown of orchids to announce my love of purple to the world. And finally, my guild proved that color challenges don't have to be scary. That might be easy for me to say, since I somehow chose colors that worked well together... but still. But seriously, check out the four pictures from our September meeting and all the amazing finishes! My guild members are a brave and extremely talented bunch. 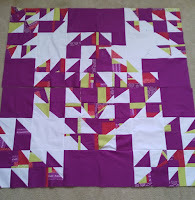 Linking up to Needle and Thread Thursday, TGIFF, Crazy Mom Quilts, Fabric Tuesday. Just beautiful! Thanks for sharing your insights and thought process in creating this quilt. This is SO gorgeous! I love your process in this and the crayon challenge sounds like a lot of fun! What a cool result out of your challenge! Nice one! Great quilt! I like that you started with a traditional block and then pushed it right to its limits; you ended up with something really striking. 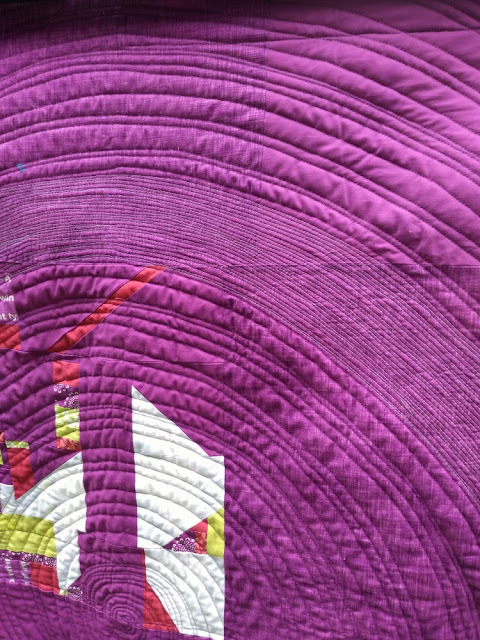 I also love how you quilted it - the spiral looks ace over all those angular shapes. Your quilting takes this to a whole new level! What a stunning quilt, Jess, and with exactly the right amount of Quilty Habit wonkiness. Your quilting couldn't be more perfect for this one. 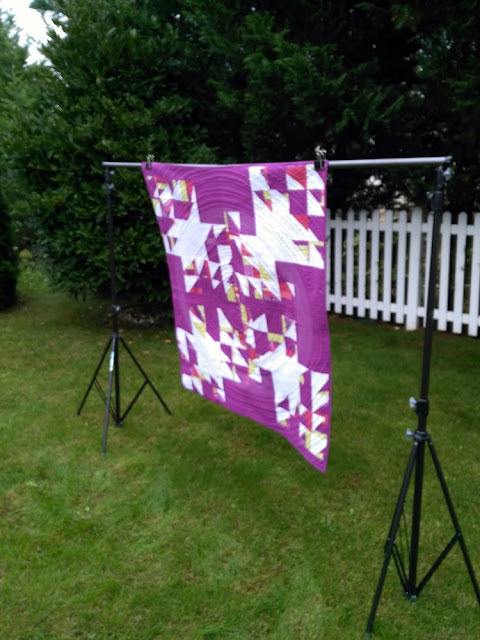 I hopped over to your guild site--what an amazing group of talented quilters--must be so much fun to be a part of :) And your Member Spotlight would've been terrific to see. your quilt is super pretty. I love it Jess. This is so creative and love the colors. Your spiral quilting is wonderful! Just beautiful! And the name is perfect too! And the quilting! Wow, I can't remember the texture of quilting coming through so strongly in a picture before. (Usually, you have to see it in person to appreciate it!) What a beautiful finish! That is a fantastic, impressive quilt! Very show worthy. Your quilting choice fits beautifully. Really beautiful. Do you mind me asking what batting you used? Cotton, wool, poly? Mid loft? I tried to email you, but I couldn't find your email, so I hope you see this! I used Hobbs 80/20 (80% cotton, 20% poly). It's the most easily available to me locally, and it's got a lovely loft.